December 1976. In April, Prime Minister Harold Wilson resigned amid a whiff of scandal, to be replaced by James Callaghan. Across the hottest summer on record, the IRA continued its campaign of terror, while in November’s US Presidential election Gerald Ford – survivor of two assassination attempts – was defeated by Jimmy Carter. It’s been 21 months since the last blog entry. Tom Baker is now firmly ensconced as the Doctor, and the show’s popularity is equalling its 1960s’ heyday, with ratings regularly in the range of 10-12 million. From a 2013 perspective, this looks like a golden age. But from the moment it was broadcast, The Deadly Assassin became the most divisive story in Doctor Who’s history. It divided fans, appalled by Robert Holmes slaying the sacred cow of continuity. It outraged certain Conservative special interest groups, and it helped to convince BBC execs that the time had come to introduce some radical changes to the way the show was made. As we’ve seen, as early as 1971 the production team was itching to abandon the UNIT format, but even by 1976, they hadn’t quite made the final break – four out of the first 11 Tom Baker stories feature UNIT to some extent, and for a viewer switching off the TV after The Seeds of Doom there’s nothing to suggest that you won’t be getting one or two contemporary Earth-based UNIT adventures per year for as long as the show is on the air. Season 14 seems to confirm this when The Hand of Fear reliably returns the TARDIS to a familiar Twentieth Century science establishment, of the type we’ve seen in some shape or form every season since 1968. But there is a subtle difference – for the first time since The Sea Devils, UNIT aren’t on hand to assist the Doctor. In this respect, The Hand of Fear is a deeply unusual contemporary Earth story. And as with The Sea Devils, removing UNIT from the equation adds more jeopardy for the Doctor – he has no back up. There is no comforting Brigadier on hand to lay on a helicopter and five rounds rapid. Taken in context with Elisabeth Sladen’s departure making the national news, The Hand of Fear has a more uncertain tone than, say, The Android Invasion or The Claws of Axos. And knowing she’s leaving means that there’s the possibility that Sarah Jane’s burial in an explosion, possession, or wandering into a nuclear reactor could really be curtains for the character. Professor Watson’s final phone call to his wife illustrates that this time, the reactor really might go critical. After all this, it’s a miracle that Sarah Jane walks out of The Hand of Fear alive (and it’s well known that producer Philip Hinchcliffe originally planned she wouldn’t). The audience is in a similar place as we are at Journey’s End, when Donna’s death has been foretold so often that we can’t quite believe she’s made it. But just as in 2008, there is a sting in the tail when the Doctor gets the call he can’t refuse, and forces his most loyal companion out of the TARDIS. Suddenly, all the rules have changed. The Doctor might have been summoned to his death. After all, the last time the Doctor visited his home planet he was “executed” and his companions had their minds wiped of all their travels with him. In that sense, his parting line to Sarah Jane, “Don’t you forget me”, has sinister overtones – because there’s the very real possibility that if he takes her to Gallifrey with him, Sarah Jane will suffer a similar fate to Jamie and Zoe, and be robbed of all her memories of this Doctor. It’s hard to gauge just how jarring this must have been for a contemporary viewer, and how shocking a set up it is for the following story – but in my mind this is Amy Pond dissolving into the Flesh, or Rose Tyler telling us that Next Time we’ll hear the story of her death. The audience is being set up for something awesome. 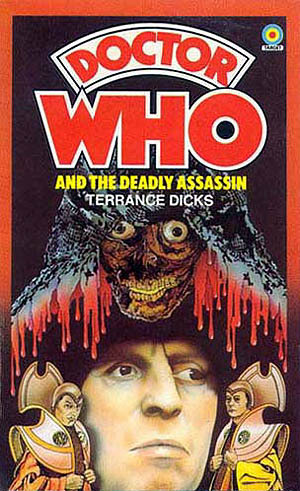 The Deadly Assassin is about as big a pay-off as it would be possible to deliver in 1976. After all, this is a series that’s already shown you the genesis of the Daleks. One of the only things that could top that about the Doctor’s first adventure on his home planet and a (long postponed) final battle against his Time Lord arch-enemy. Everything about The Deadly Assassin suggests what we’d nowadays call Event TV. It’s even positioned as the end of a mini-series of adventures, followed by a six-week gap – Steven Moffat must’ve been taking notes. In this story, Holmes finally seems to be unleashing the joyful anarchy that was apparent in his first script, The Krotons. The Time Lords introduced constraints into the Doctor’s universe, made him obey their rules, regulated his freedom and limited his adventures. The Deadly Assassin gleefully smashes all of that. Last time the Doctor left Gallifrey he was a prisoner, diminished. This time he leaves it as a liberator. That’s surely got to be a statement of intent: Hinchcliffe and Holmes finally getting out of the shadow of Letts and Dicks, and declaring that Doctor Who will no longer be looking respectfully to its past for inspiration, that the best is yet to come. This season has been an exorcism, leaving behind the Doctor’s ties to Twentieth Century Earth and Gallifrey and setting him off on new adventures. The stakes are raised when we learn that the Doctor is going into battle against a Master who is no longer the comfortable “best enemy” of the Pertwee years. Without Delgado’s charm and wry sense of humour, the Master has been stripped to his basics; robbed of his attractive facade, he becomes the very image of Death itself. The dying Master is a culmination of the kind of crippled villains Robert Holmes specialises in. While it would be clearly wrong to equate disability with villainy, I don’t think that’s Holmes’ intent. Right from The Krotons, Holmes has been interested in monsters that are vulnerable or weak in some respect, suggesting that this makes them even more frightening. Inverting the usual Troughton formula, the Krotons are monsters under siege, surrounded in their base by potentially hostile aliens. Linx the Sontaran is stranded, alone, on one planet at a primitive stage in its history. The Wirrn are far from home and desperate. The Cybermen are a pathetic bunch of tin soldiers. Sutekh is trapped and immobile. Morbius envies a vegetable. The Master is horribly scarred, in pain and dying. All of them have one thing in common – a desperate need to survive at any cost. They will do anything to cheat death, and that makes them terribly dangerous. However wrong she was on every other count, Mary Whitehouse was right to recognise the Doctor is in extraordinary peril in the final cliffhanger: his body is lying dying on a slab and he’s fighting for his soul in a hellish world of the Master’s creation. But mention of Mrs Whitehouse reminds us why, behind the scenes, The Deadly Assassin represents a kind of climax as well – because, on the basis of her hysterical complaints about this story, Philip Hinchcliffe was reassigned, and Graham Williams brought in with the explicit instruction to tone the show down. Of course, that doesn’t happen for another three stories – but we also know Hinchcliffe, with nothing left to lose, decided to overspend on The Robots of Death and The Talons of Weng-Chiang which had a knock-on effect on Season 15’s budget and landed his successor with a financial as well as creative crisis. The legacy of The Deadly Assassin can therefore be felt both onscreen and behind the scenes. After a final, lavish mini-series of adventures, we get the cash-strapped Williams stories that, for all their brilliant attempts to overcome the need to avoid any kind of visual horror, look shoddy in comparison. It’s a tragic irony that at the moment of their greatest confidence, when they were ready to set the TARDIS off on a journey into uncharted territories, free of the baggage of the last 13 years, Philip Hinchcliffe and Robert Holmes were brought down to Earth by the forces of conservatism they railed against in The Deadly Assassin, and never got the chance to fully reveal their vision for Doctor Who. Even as the Doctor saves Gallifrey, he is being airbrushed out of his own ultimate victory. Borusa reminds us that time can be rewritten, that the Time Lords will remember Goth as the hero, preserving Gallifrey’s values of ordered calm against a fiend who glories in chaos and destruction. The Establishment triumphs, once again, while the Doctor runs. Nothing important happened today. Next Time: “That’s what you are. A big old punk with a bit of rockabillly thrown in.” The Doctor faces the consequences of his actions in The Face of Evil.